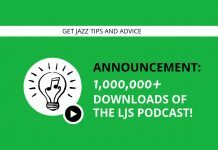 Welcome to episode 60 of the LJS Podcast where today we have special guest jazz pianist and vocalist Aimee Nolte on the show to talk about developing relative pitch. Wouldn’t it be awesome to hear a note being played and know exactly what it is, even if you don’t have perfect pitch? Aimee teaches us how. Listen in! How Aimee found out she has perfect pitch. How to take your Perfect Pitch Jam and use intervals and scales to discover new notes. The importance of being able to sing what you hear. 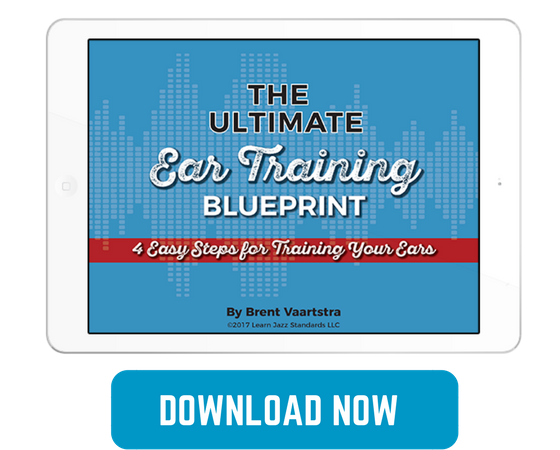 Aimee puts Brent to the test with an ear training exercise. 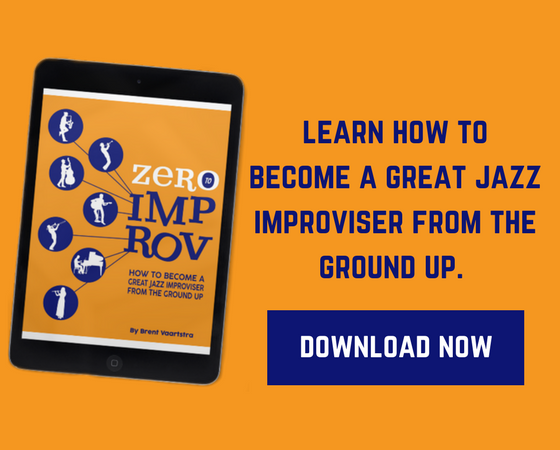 Our flagship eBook, Zero to Improv, is a book that teaches you how to become a great jazz improviser from the ground up. No stone is left un-turned. This isn’t your ordinary music book. Zero to Improv calls you to action! Packed full of improv and jazz theory lessons, you’ll start from the beginning and build up all of the skills and knowledge you need. Audio examples are included for all music notation. Versions are available for C, Bb, Eb and Bass Clef instruments. Designed for all skill levels. Have anything to add to today’s show? Leave us a comment below. Hi Brent. I'm Luiz from Rio de Janeiro, Brazil. I've just tryed the exercise Aimee suggested and i'm really amazed with the results. Some songs i've listened in the last weeks i got 1/4 or 1/2 tone of range, but there was a song from my childhood that i got exactly the note: a D. I'm so happy! Thanks! Hey Luiz! Glad you enjoyed the episode. Keep practicing! Nice episode Brent! I'm a follower of Aimee's videos on YT, she's excellent at reaching beginners to intermediate players in a way which is didactical and relaxed at the same time. My experience is that perfect pitch is something which is almost impossible to learn or practice: either you have it or you don't. I've been trying myself for weeks… I'm not sure it is necessary to be a jazz musician by the way. As mentioned in the podcast, the ability to recognize intervals (which can be practiced) but also to identify tone "colors" (e.g. a b9 or a #11 in the middle of a dominant chord) regardless of the actual key is much more important in my opinion. Thanks for listening! I think you're right. Perfect pitch isn't necessary, but it can be helpful to try to attain a certain degree of relative pitch so that you can identify these color tones. Great insight, Phil! Brent, thank you for this podcast! Aimee is outstanding and a great addition to my jazz resources. I am really pleased with "Zero to Improv", which is a wonderful companion to the 30 days course. Congratulations on the fine website and content!